Independent, small group and guided word work activities are an essential part of learning to read. However, sometimes these activities are time-consuming to prepare, convoluted, ineffective – not to mention far too often a storage hassle. I find the best resources provide a familiarity that makes students comfortable in investigating new concepts. The key to using word work practice is to allow students to explore and develop new knowledge through practice and “play”. When students are familiar with the structure of the word work, the expectation and/or content can vary slightly with minimal need for instruction and support. Implementing “familiar” word work helps students develop independence, confidence and increase knowledge in specific phonic skills. In my classroom, we use Reading Foundations with Phonics every week as a support to our district purchased curriculum. The activities are routine and expected even though the concepts covered grow weekly in depth and complexity. Because of the clear, effective routine, my kiddos know exactly HOW to interact with each piece, therefore they are not intimated when it comes time to work on a higher level. Additionally, the word work activities we use daily are familiar and routine. I do not have to spend a lot of time explaining the activities that are available to the little peeps each week because they are already familiar with them. I just let them know about the new focus and deeper expectation and they are ready to go! Let’s face it, primary teachers have a TON of prep to do. Printing, laminating, cutting and storing is easily a full-time job. It’s also extremely costly. These are just a few of the short vowel activities my kiddos do with Short Vowel Word Work Extravaganza. ALL of these activities (plus another 10!) use the SAME SET OF CARDS. That’s super important in so many ways! First of all, I only need to print the one set. Right off, that’s time and money saving! Second, my kiddos quickly grow accustomed to the cards. The familiarity gives them security even when I change up the activity with which they will use them. Some of the kids prefer working with a pocket chart, others prefer the floor or a table. It really makes no difference to me. I just want it to be easy to use, enticing and easy to clean up. It definitely fits all those needs. Above are the cards we use. This is a photo of a simple matching game the kiddos do to practice reading CVC words. These are the exact same cards we use for another 19 practice activities. This one set provides MORE than a year’s worth of different activities! I introduce one new activity each week with our cards. Between the short vowel and long vowel set, that’s 40 weeks of activities!! Also – A HUGE PLUS – storage is so simple and negligible. I just keep the entire resource in one ziplock bag! My kids do the activities that require a recording sheet using wipe off sleeves so the pages are constantly reusable. There is nothing to collect or grade. No need for a ton of copies! These purposeful activities are tremendous support for even the most reluctant and struggling reader. Not only are they perfect for independent practice, but they also serve as helpful tools during guided reading groups. The depth and complexity of the activities grow and provide plenty of opportunity for necessary differentiation. 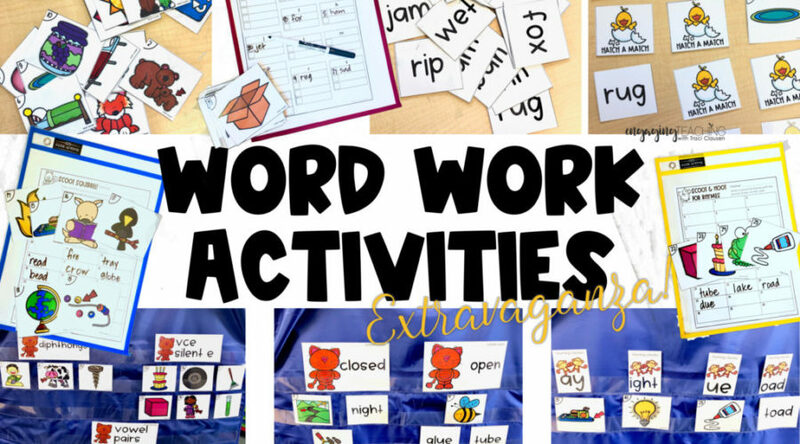 Visit my store to see more about the Word Work Activity Extravaganza resources. Click the images below to go directly to the resource.